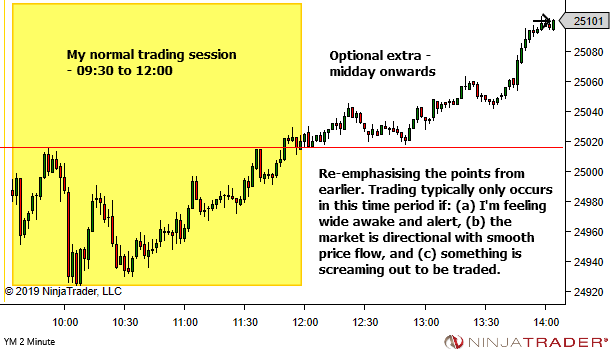 My normal trading times are between 09:30am and 12:00 midday US Eastern Time. 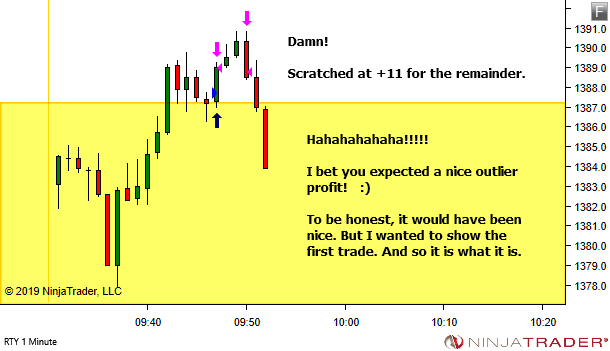 You won't see many trades after midday because in my timezone that is 3:00am. It's time to complete my post-trading routine before getting some well deserved rest. But occasionally circumstances allow me to push a little beyond this midday (3:00am) time limit. 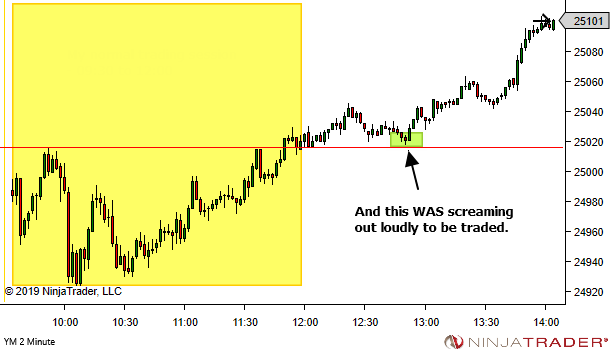 This occurs ONLY in those times when (a) I'm feeling wide awake and alert, (b) the market is directional with smooth price flow, and (c) something is screaming out to be traded. So that raises a good question. What exactly is something that is screaming out to be traded? Unfortunately that's difficult to define. Essentially it's a feeling. Let me explain. The default option is to stand aside. Most setups I just leave alone. 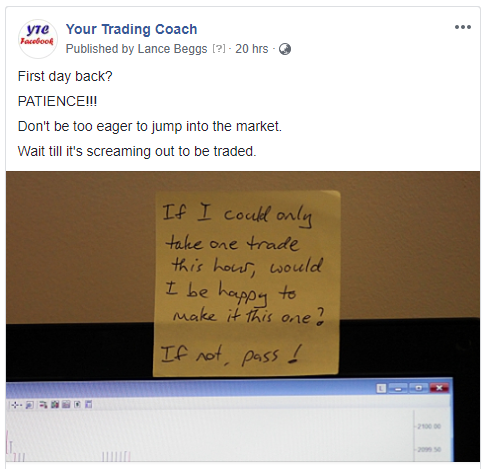 I'd rather get on with my post-trading routine. 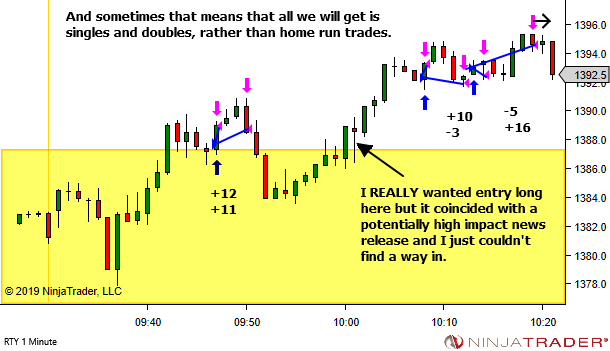 But from time to time the market sets up in such a way that I just KNOW… I have to be in this trade. This one is so good. It's an A+ trade. An edge that is so obvious that I'd be a fool to miss it. 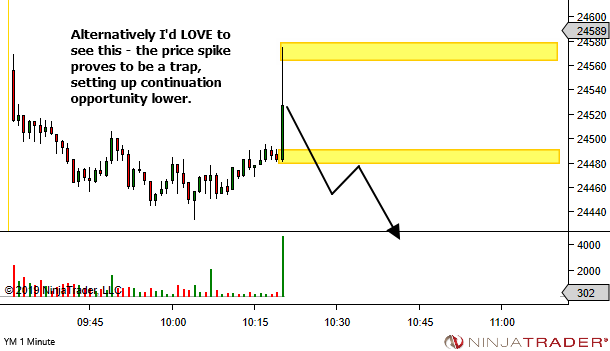 A trade which I'd rather enter and take a loss than miss the opportunity entirely. 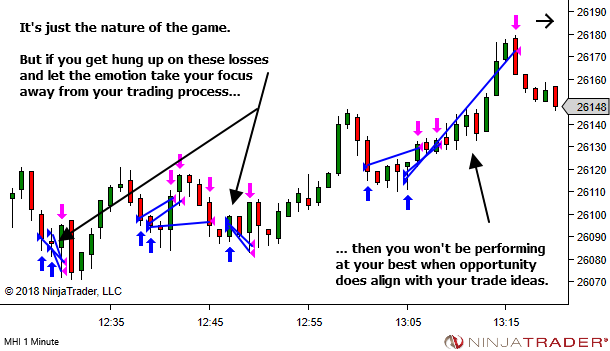 Think carefully about that last statement if you're new to trading! From a technical perspective though, they will almost always involve a trap of some kind. You need to sense the blood in the water. Someone, somewhere, has got themselves caught. There is pain. There is emotion. And for me… there is opportunity. Today… we get to see one of these trades. A trap on a retest of a level. A setup that was screaming out to be traded. 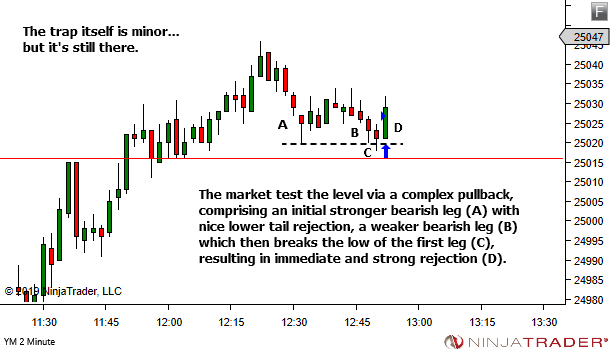 NOTE: Complex pullbacks plus the strength/weakness analysis used in this example are all covered in the YTC Price Action Trader. I don't care how good your analysis is. There are NEVER any certainties that a target will be hit. 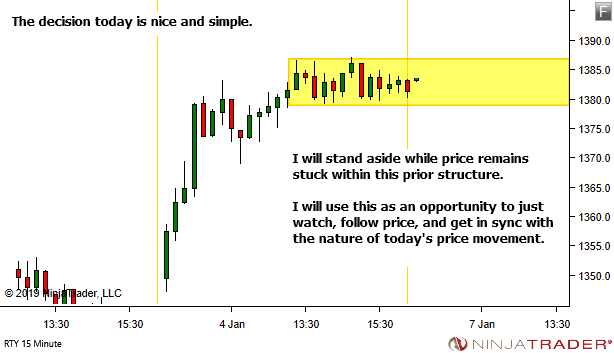 So let's look at a little technique which can help your decision making during both the trade planning and trade management phases. This article idea was prompted by some great email Q&A I received recently. Let's start with the email question and response. I'll then expand upon part of my reply, as I think it's an important topic that deserves further discussion. 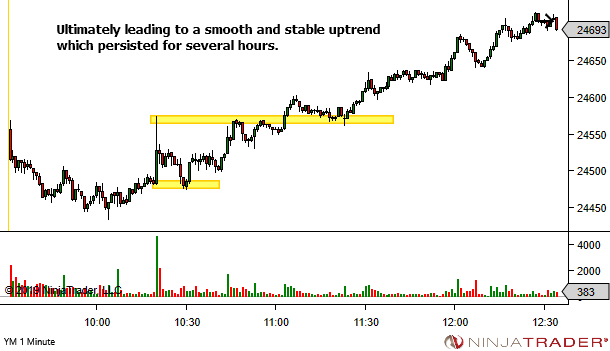 The email included a 30-minute Higher Timeframe chart. It's not reproduced here. 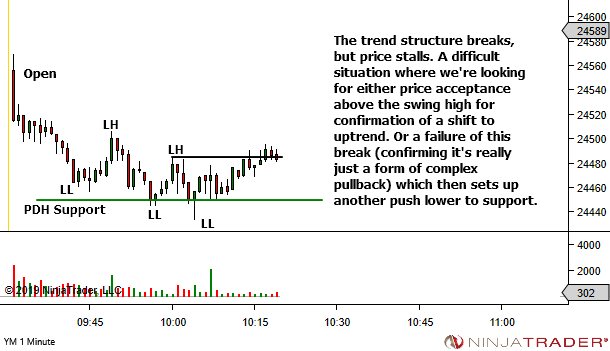 It's sufficient to know that the higher timeframe is in an uptrend. 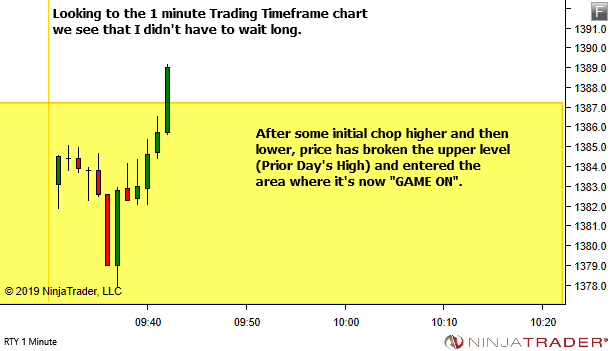 The following is the 3-minute Trading Timeframe chart showing the prior day in the left half and the current day to the right. Click on the image if you want to open a larger copy in your browser… or just skip down lower to where I've zoomed in to the current session. As per chart on 17th I was long on the days range low also the price was above the previous day close. 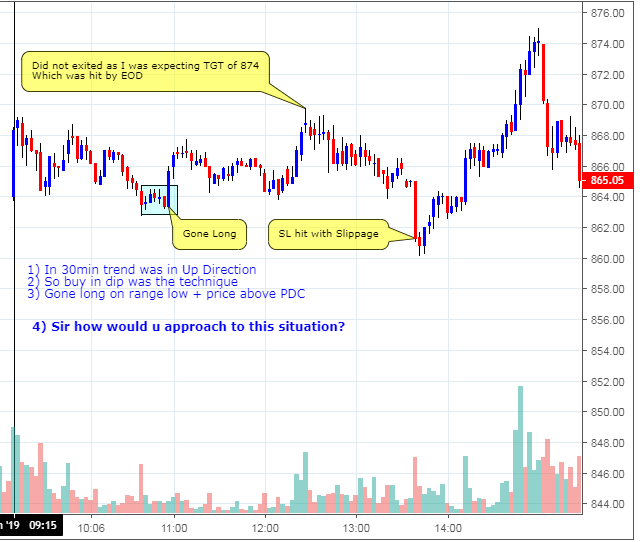 So decided to go long on range low (865 with sl 862) as the major trend in 30min was in up trend. 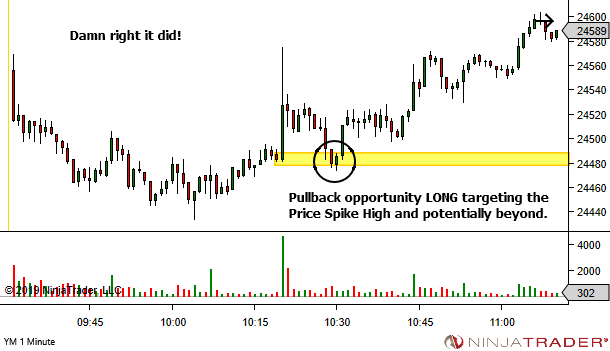 So I was right in my analysis however and kept my position open even though price hit the range high of the day with the expectation of reaching the target of 874. However it didn't went as per the expected and my SL got hit and post my SL hit , price went till 875 and hit achieved my TGT. Sir if I m wrong and my SL get hit I can understand that, however if I m right and my SL space is right and my Sl get hit and post that TGT is achieved . How to handle these kind of situation? 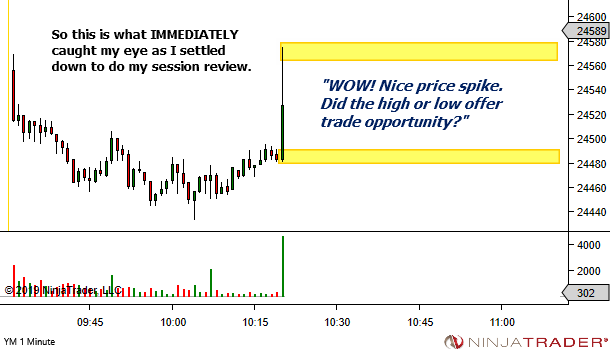 I must say… I love the trade entry. 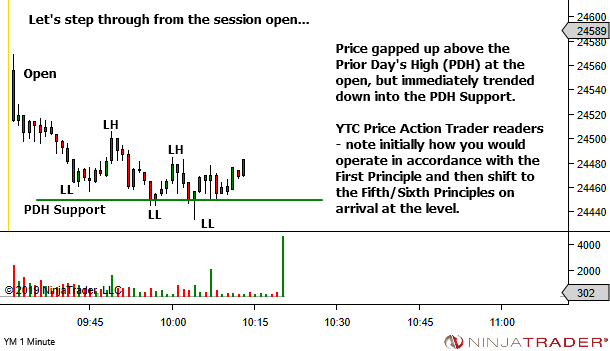 From a YTC perspective it's aBOF of the low of day support, coinciding with the prior day's high resistance, in the direction of a longer-term uptrend. You ask, "How to handle this kind of situation?" There is no "situation" here. What has happened is completely normal in the markets. 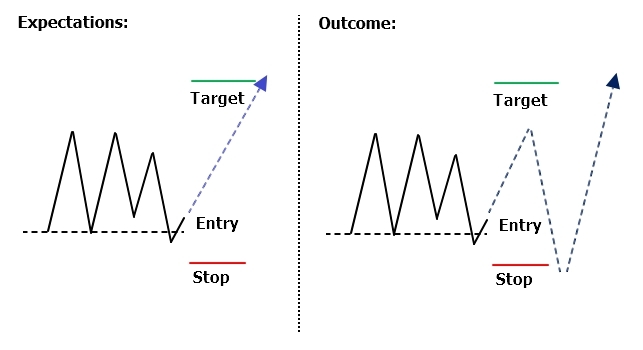 The nature of price is that it often involves tests, retests, probes, spikes and all manner of action that traps people and stops them out before going on to the target. This is completely common. 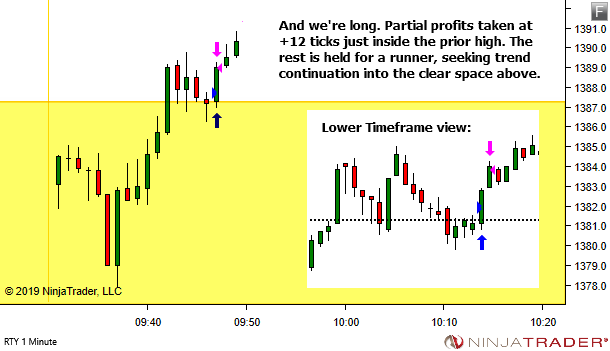 (a) The market on this trading timeframe is ranging. You entered beautifully. But I would have taken at least partial profits at the range high. 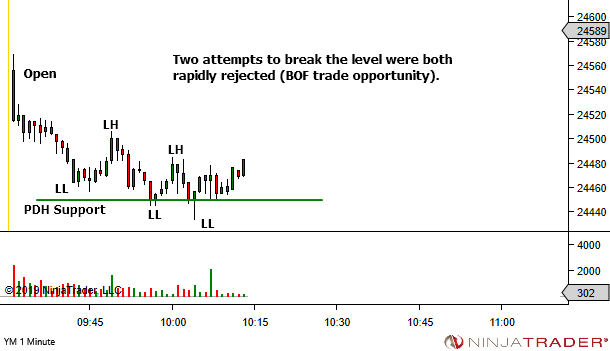 It's the nature of ranging markets that they will continue to range, until orderflow triggers the breakout. There are no certainties in the market. 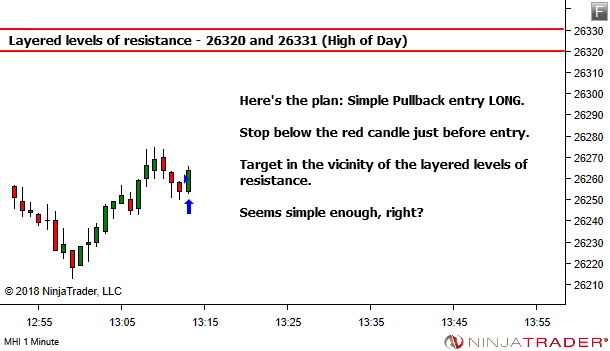 So while you identified a good target much higher than the upper range boundary, surely you MUST have in mind the potential for the range resistance to hold. In that case, take part of the position off. (b) And then being stopped out on the remainder, why did you not get back in? There's a beautiful re-entry just after 14:00. 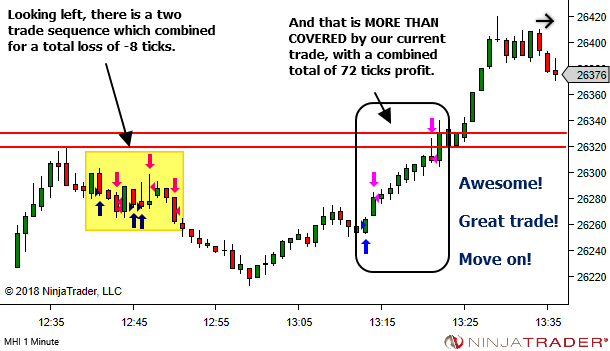 Sometimes a trade takes two attempts! This is the point of today's article. As mentioned earlier… I don't care how good your analysis is. There are NEVER any certainties that a target will be hit. 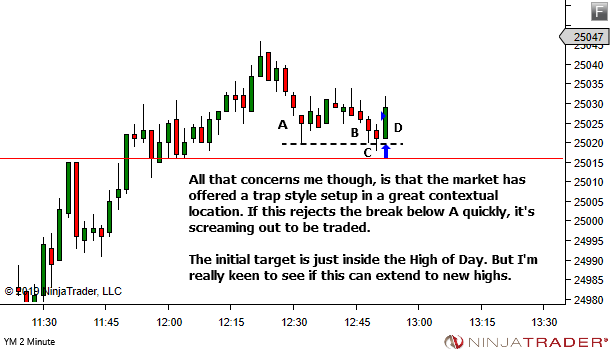 So here's a little tip which can improve your decision making regarding targets. After selecting your target, apply a degree of confidence. For the example above, instead of saying "the price target is 874", the trader might have said "the price target is 874, with a 70% degree of confidence". Or whatever other percentage they thought was appropriate. The thing is – it's NEVER 100%. In fact, I'd go as far as to say you should never select more than maybe 80%. It forces your mind to accept the possibility that the target may not be hit. If we selected the target with a 70% degree of confidence, then this means there is a 30% chance it won't be hit. 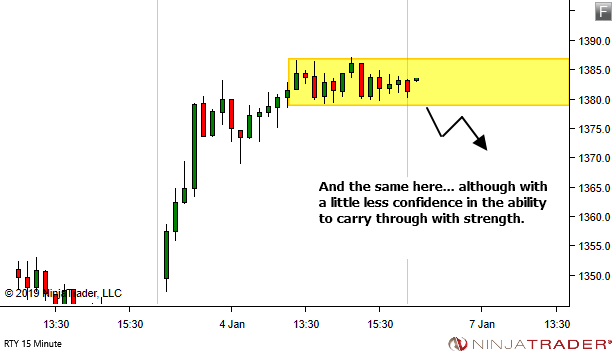 So in planning out the trade we might consider alternate IF-THEN scenarios involving possible exits at the range highs, should they fail to break. Give it a try. 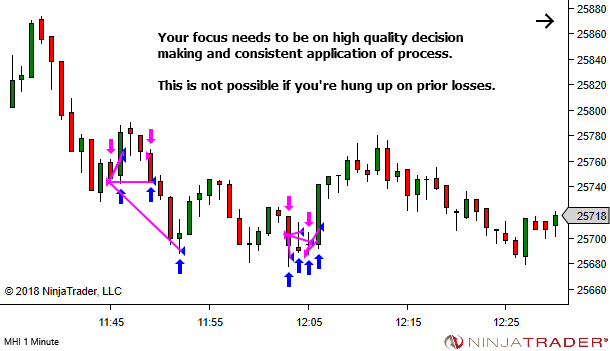 See if this helps improve both your trade planning and your subsequent trade management decisions. 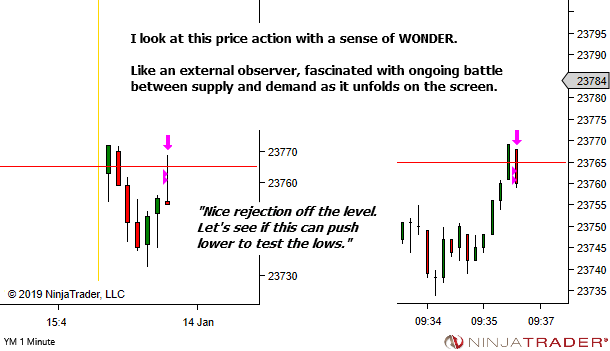 And for more advanced application… continue to update that degree of confidence as more data unfolds in real-time. 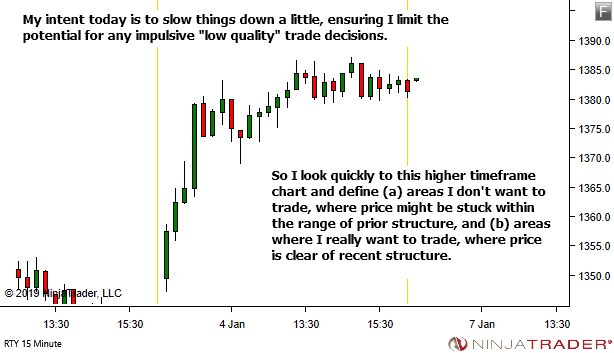 Let's start with a little disclaimer – I didn't trade this price sequence. I took a break on Friday 18th of January in an effort to manage my fatigue levels. But this does not mean that I don't review the session. 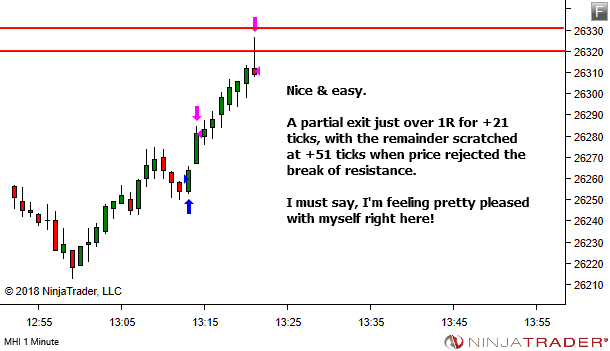 The next day I scheduled some time to look over the charts in a number of markets in order to (a) see how I would have traded them, and (b) complete an entry in my Market Structure & Price Action Journal. Yes… just because you skip a session it doesn't mean you get to skip the study! 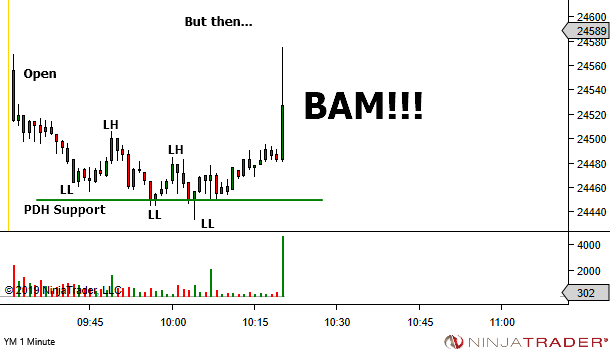 One of the very first things to jump out of the screens at me, upon opening the 1-minute Emini-Dow futures chart, was an awesome price spike at 10:19am. This became the focus of some extra study, for my journal. And I thought I should discuss it with you here today as well. 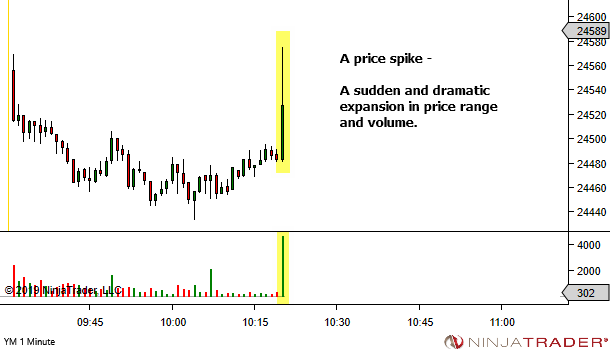 I love price spikes – a sudden and dramatic expansion in price range and volume. Because they often create a shift in the market structure. And they allow you to immediately identify two potentially great trade locations. Let's have a look at the charts. Your mindset is either working for you or against you. To some degree, you get to choose. NOTE: An essential ingredient in operating with a mindset of wonder is a pre-acceptance of risk. We discussed this recently here. With the above preconditions in place, reframe any nerves you feel as WONDER. And watch fascinated as the future unfolds before your eyes. I don't know if you're like me, but if you are then you'll have this dark-side of your personality that surfaces from time to time. A side that just WANTS TO TRADE. A side which doesn't so much care about the conditions of the market. 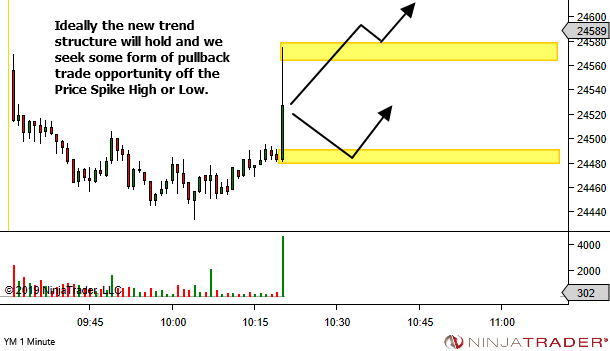 Given the slightest hint of opportunity, it wants to get into a position and trade. 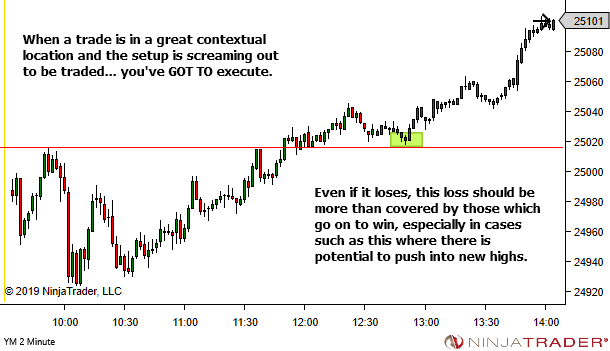 And of course, while that will from time to time capture the good moves, it also means you're often stuck in a fight for survival through the all of the market chop that you just KNOW is better avoided. I'm much better at managing this now. 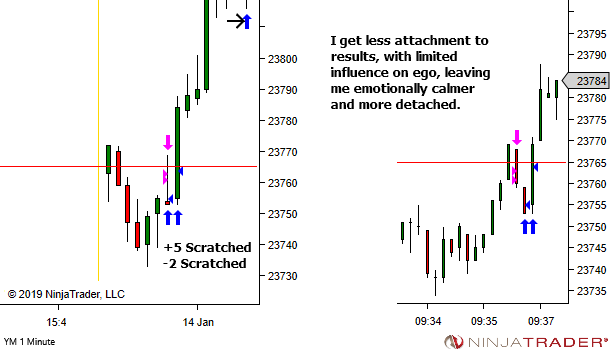 One of the most significant changes to my trading over recent years has been an increasing ability to accept less trades. But I do need to remind myself of this from time to time. Occasionally that impulsive side of my personality finds itself in control of the mouse, despite my better intentions. But often a simple reminder to be patient is not enough. So here's another of the things I will often do to slow down that impulsive side of my nature. A tactic I use when first coming back from a break. 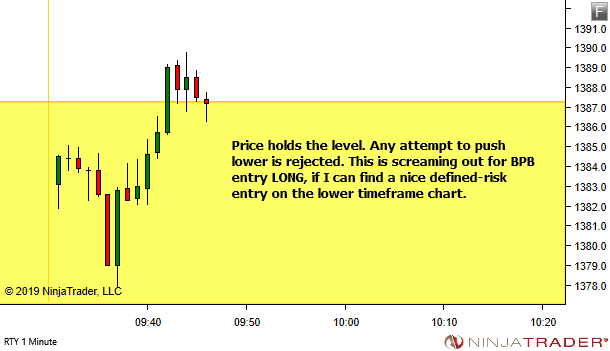 And also from time to time intra-session if I find myself frustrated and struggling to read the price action. WAIT TILL IT'S CLEAR OF RECENT STRUCTURE. 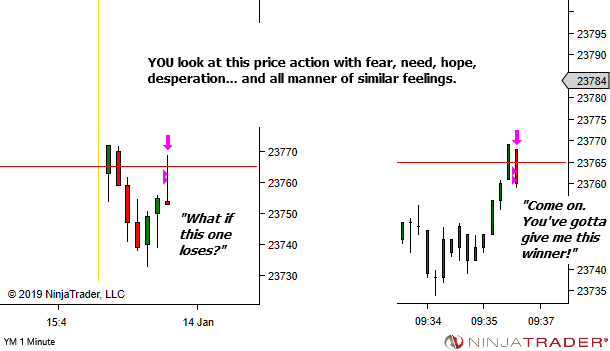 Look at either the Trading or Higher Timeframe Charts. 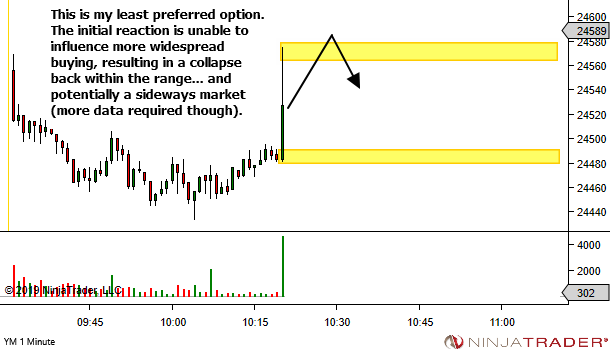 Find areas above and/or below recent structure which offer clear space and potential for an obvious directional bias. Firstly, this gives me permission to "sit on my hands" until an area of the chart with greater potential for ideal trading conditions. 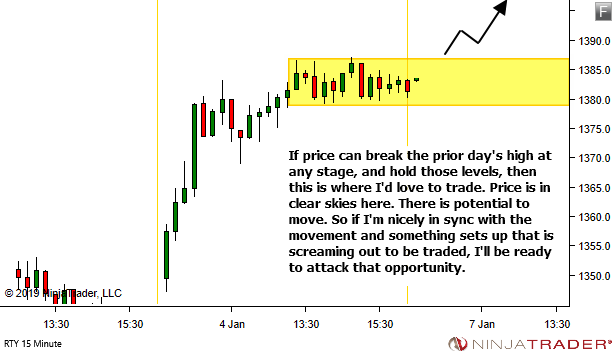 And secondly, this gives me time to just watch price, getting in flow with the movement and the pace, so that when good conditions are present and a trade opportunity sets up, I'm ready to attack. 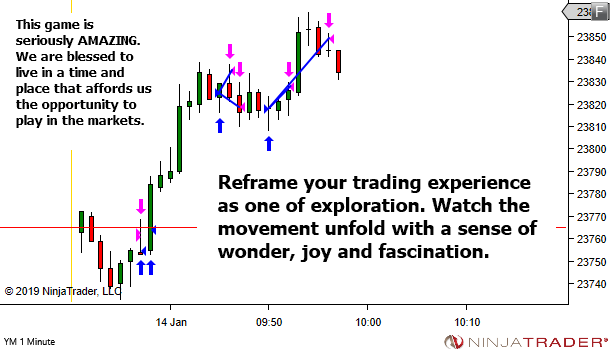 Define the places you want to trade, clear of any recent structure. Sit back and relax and enjoy the show. Let price do it's thing. Someone else can trade here. 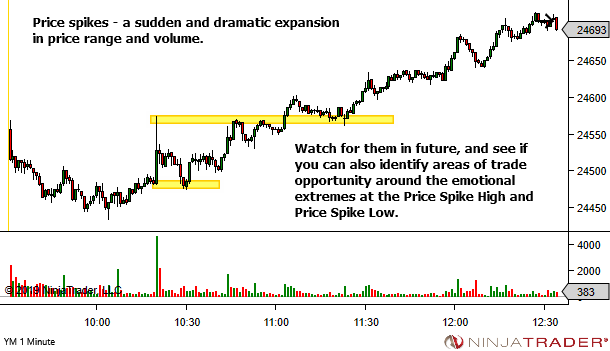 Just watch and get in sync with the movement, so that when price decides to play in YOUR playground, you're ready. 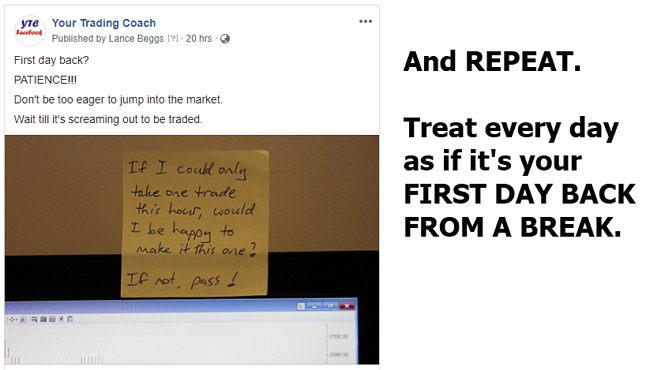 I will NEVER take a trade without having pre-accepted the potential for trade loss. Because the fact is that MANY will lose. 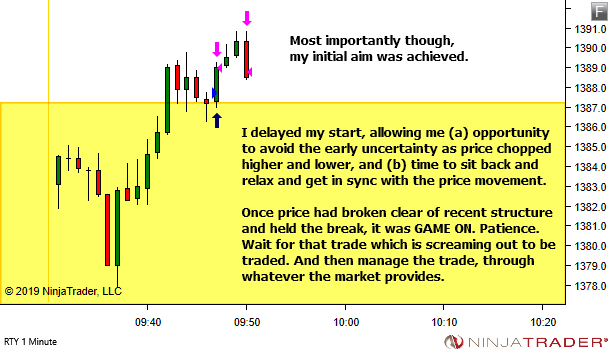 Pre-acceptance of trade risk means that I am comfortable with taking the loss and will do so immediately without hesitation. Pre-acceptance of trade risk means that I'm not overly concerned with the monetary loss and can keep my focus on the process of analysis and effective decision making. My focus remains on process, rather than outcome! 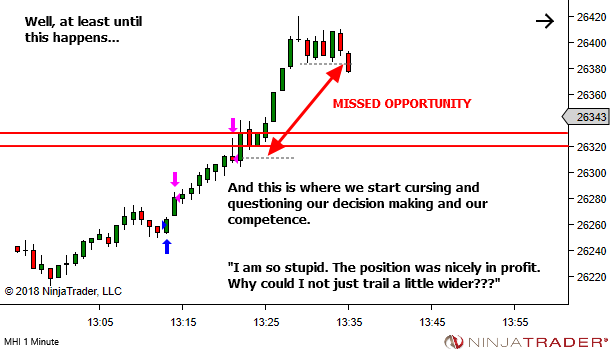 Ask yourself before entry, "Am I comfortable with this trade losing?" 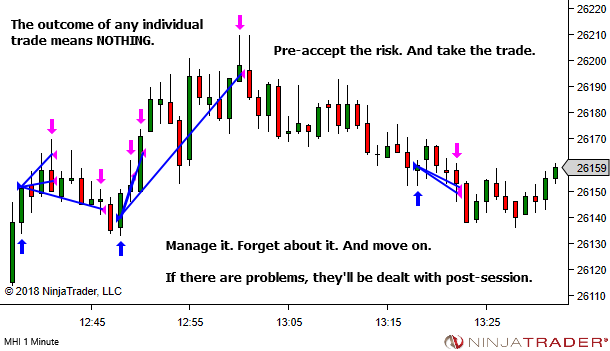 If you're not comfortable with this trade losing then you've likely not yet achieved sufficient confidence in your strategy, or you're trading with too much risk. You will likely hesitate to take the exit, ensuring a greater than necessary loss. 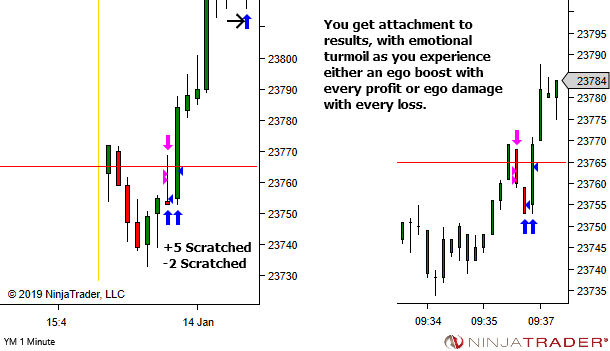 And you will likely carry some psychological baggage into the next trade, increasing the chance of poor analysis or decision making and greatly increasing the chance of further losses. 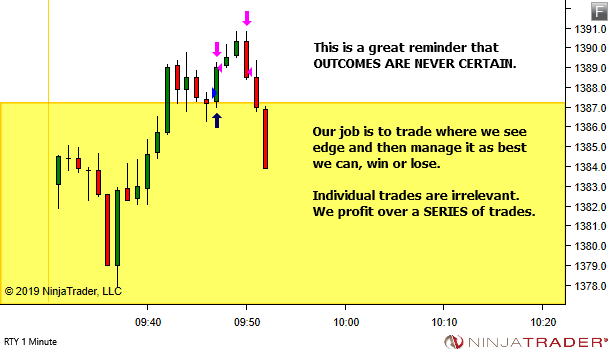 A full loss on this trade will not break any session drawdown limits. A full loss on this trade is PERSONALLY acceptable. 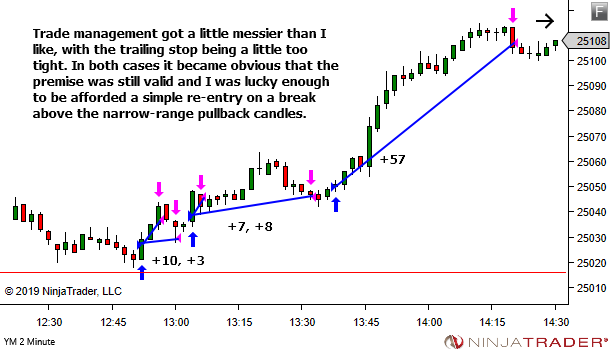 I am completely comfortable taking the loss and moving on to the next trade. Because if either of these are not true, then you have no business taking the trade. What if you Redefined your Primary Role as a Discretionary Trader? What if you switched this around a bit? 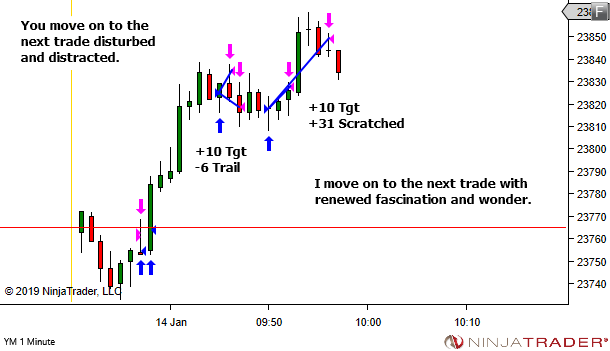 Is it possible that relentless focus and commitment to the processes and routines which guide your decision making and behaviour… might just see improvement in the actual trading results? This doesn't mean we're no longer discretionary traders. Discretion can be built into processes. But how we come about our trade decisions, is standardised and made as consistent as possible. Essentially, we're expanding upon this idea. Seek consistency in implementing the routines and processes. It's said, "That which is measured, improves". But ONLY if that which is measured is applied consistently. 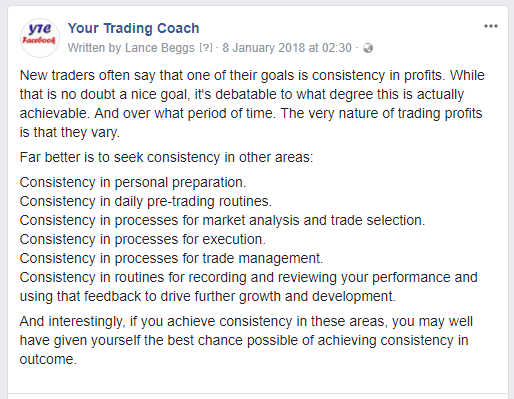 And consistency will only occur if the process is clearly defined. 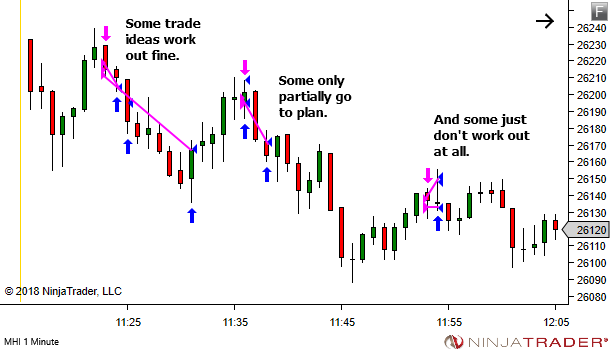 So maybe consider a little shift in how you define your role as a trader. 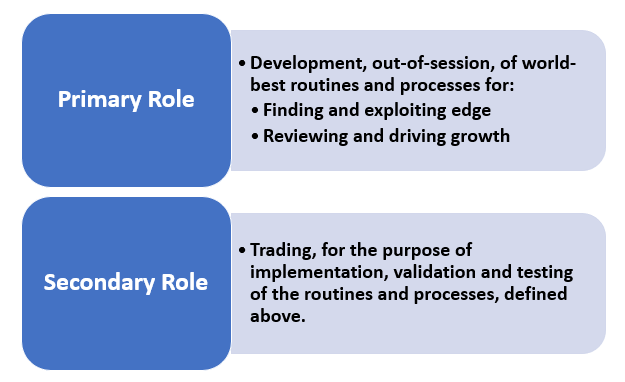 Primary role: Development, out-of-session, of world-best routines and processes for (a) finding and exploiting edge, and (b) reviewing and driving growth. 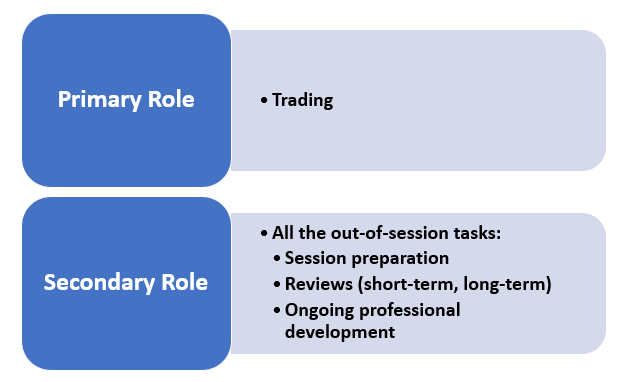 Secondary role: Trading, for the purpose of implementation, validation and testing of the routines and processes, defined above. My performance last year… NO LONGER MATTERS. WHAT MATTERS… IS WHAT I DO RIGHT NOW! I don't yet know the challenges that I'll face in the new year, but I know that I will be ready. As the opening bell rings on day one, I will be primed for peak performance. Physically, mentally and emotionally recharged. 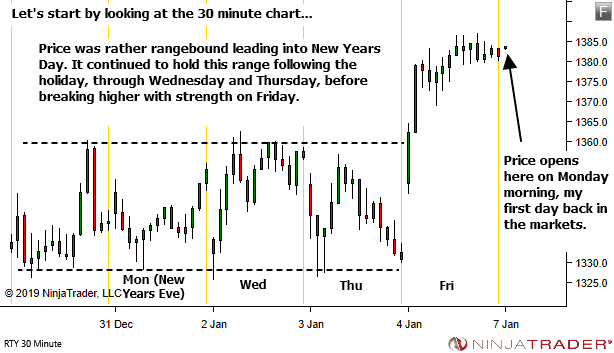 I don't yet know the market conditions that I'll face in the new year, but I know that I will be ready. And I will have learnt from the lessons of the past. My performance and process reviews will have identified both successes and failures. That which I did poorly… I'll know exactly how to improve. And that which I did well… I'll know exactly how to do better. I don't yet know the price sequences that I'll face in the new year, but I know that I will be ready. All set for quality decision making and process-driven focus, no matter what the markets throw at me. When the new year comes… I'll be ready. One of the essential breakthroughs we need to make in our journey involves learning to think in probabilities. 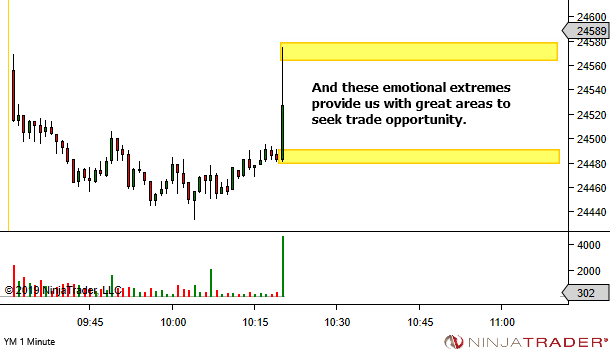 It's something that all traders say they understand. 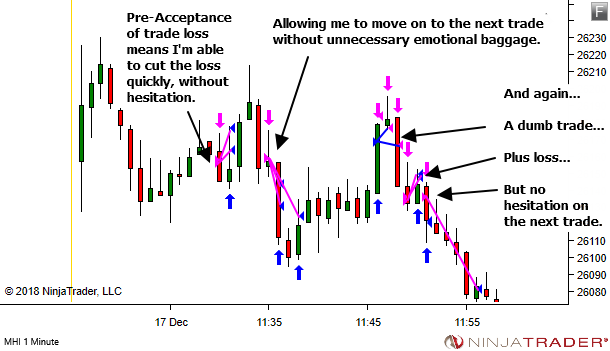 But, for most new traders, their behaviour and decision-making shows that it has not been accepted. If you can comment and/or direct me to something on your site, that would be great. 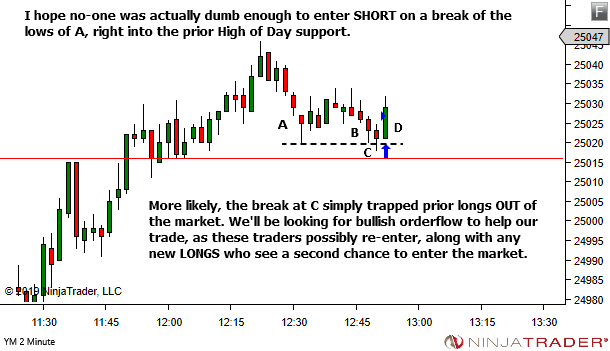 Here's the chart using my usual display format. 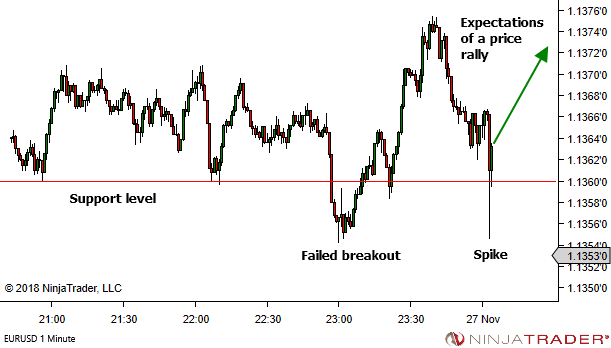 I've added a higher timeframe support level and positioned the spike at the right hand side. 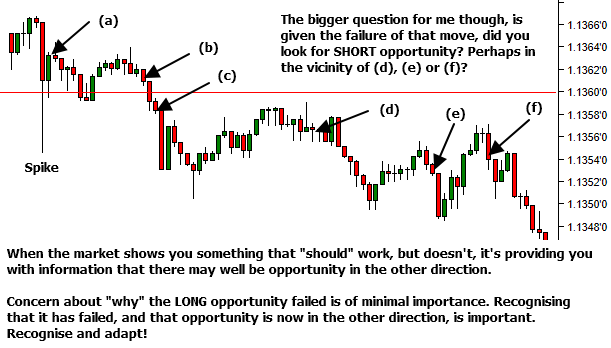 The question again – "When I’ve observed this very thing (over several years) Price Action “always” moves HIGHER… Today, it Moved LOWER and wanted to educate myself on WHY…"
My big problem is with the word "always". Yes, it's in quotes. But it still concerns me. 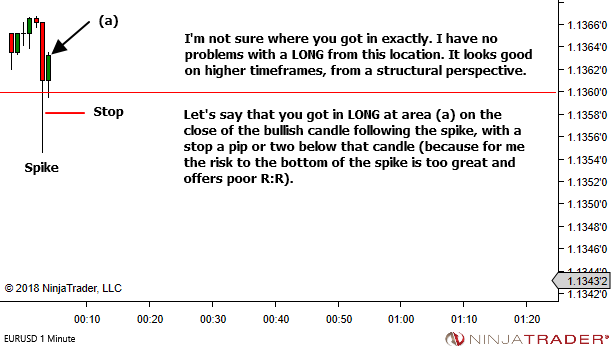 Here's an excerpt from my reply (noting that at this stage I had no idea of the market or timeframe and was replying based upon the original black-background chart image above). I can't really answer as to why this move went lower, being unsure of which market and timeframe and whether this price move coincided with any news event (planned or unplanned). 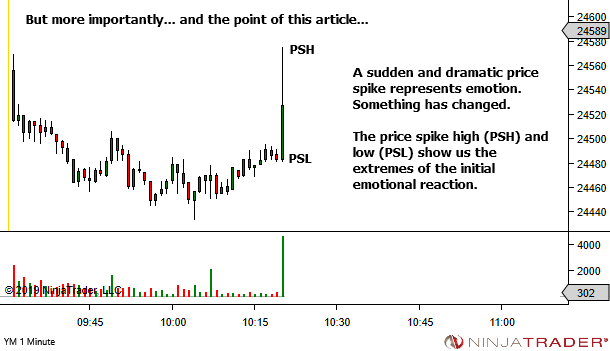 Typically we can't ever know with complete certainty the reasons for any price movement. 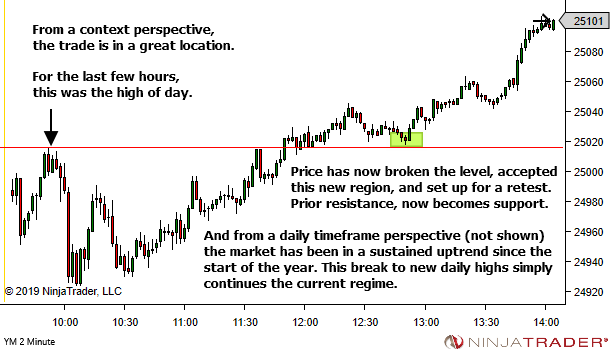 Price moves where it does based upon the orders that hit the market. Why did it go lower? Because the net effect of all the orders was bearish. 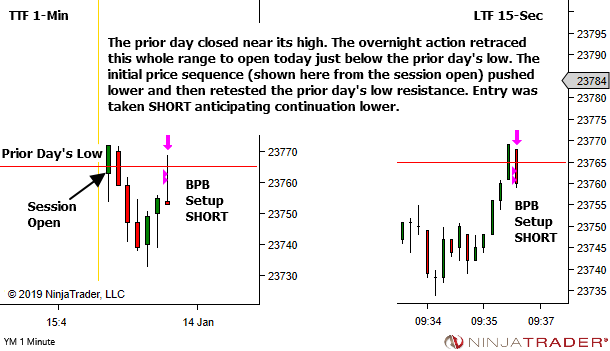 Any discussion as to why trade decisions were net bearish, is simply speculation. 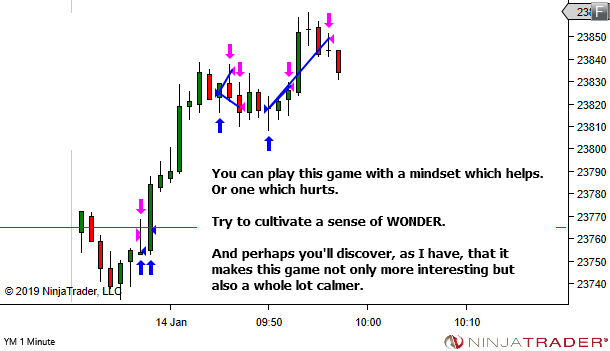 The error in your thought process is when you use the word "always" in this sentence – "When I've observed this very thing (over several years) Price Action "always" moves HIGHER." Does it really always move higher? Or were there actually some occurrences where it moved lower? We're dealing with probabilities, not certainties. Nothing "always" happens. Even if this was a 99% probability of moving higher (which it's not because nothing is that close to certain) then there would still be 1 out of 100 cases where it moves lower. This example was that 1 occurrence. Let's say the pattern has actually 55% probability of moving higher, which might be more realistic. This example then simply sits on the 45% side. So it's nothing unusual. And nothing that needs understanding "why". What is important is firstly that you shift your thinking away from certainties to probabilities. 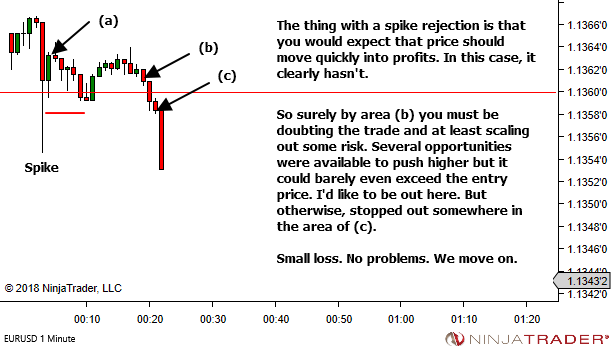 And secondly, that if you're trading something like this and take a position LONG in expectation of movement higher, that you recognise as quickly as possible that this occurrence is falling on the losing side of the probabilities, and you adapt quickly and get out. "Why" is not important. Recognising and adapting is important. 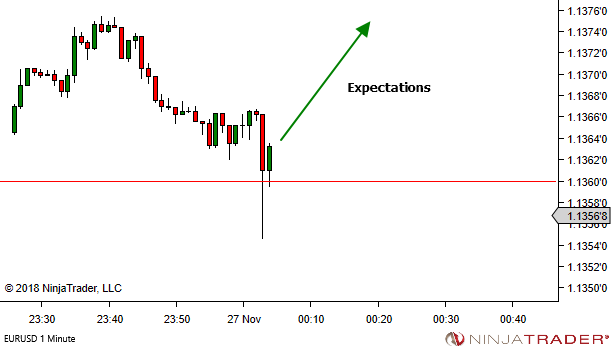 Subsequent discussions confirmed the market as EURUSD, 1 minute chart, on 26th November 2018. 1. Knowing the market, date and time, I was then able to confirm that the price spike occurred just two minutes after 09:00 US Eastern Time (two minutes after midnight my time). 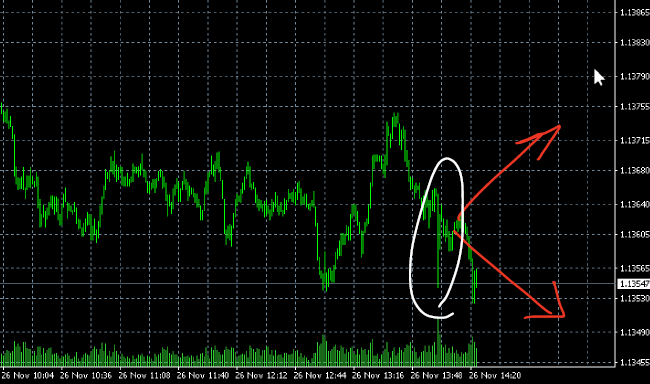 Two minutes prior to that spike there was a scheduled speech by the ECB President. 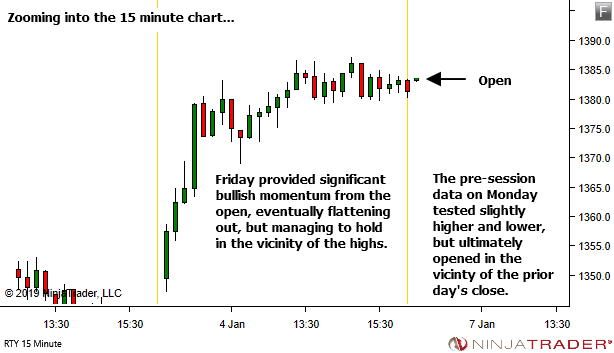 Given the high-impact potential for such an event (especially given the current Brexit negotiations) it's reasonable to expect that such an event could completely shift the sentiment in the market, rendering any prior analysis and levels as irrelevant. Just something to consider! 2. 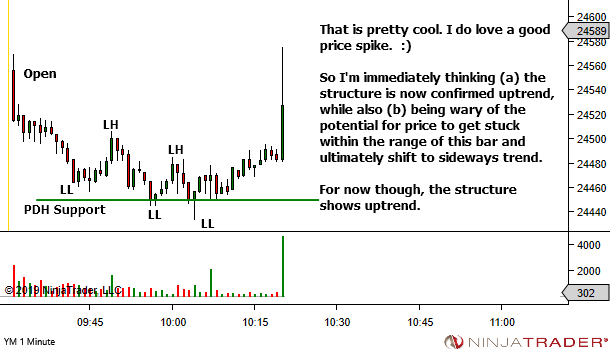 For those interested, I actually have no problems with someone entering LONG from that spike. The following are my thoughts regarding the price movement following the spike, looking purely from a price action perspective.